Look, you’re too old. Hang it up, relax and take it easy. Grow a spare tire. You earned it. In a youth-obsessed culture, it’s easy for those over the proverbial hill to watch the age train slip away from the station, cash in their chips and believe the propaganda: people your age just don’t do that. From old drinking buddies, to once-great high school superstars, you can get an ear full of the past tense. Don’t you believe a word of it! Take my lifelong friend, David Johns, for instance. He says, "Every day you do nothing, you’re one step closer to the grave. Start small..." He should know. At 52 he has won the 2016 IPL World Championships and the 2017 National Championships in power lifting. He holds six world records and shows no signs of slowing down as his career takes him into strong man competitions. When asked how he feels about his age he says, "Never felt stronger, and love lifting next to guys half my age who can't pull a 705 deadlift." Meet Jeff Bonugli, owner and head instructor of Family Jiu Jitsu & Karate in New Braunfels. 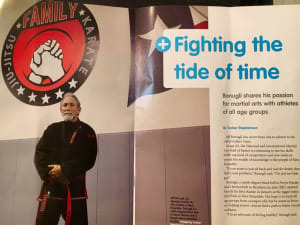 He was recently featured in the Seniors Edition of New Braunfels Living Well Magazine, speaking about his new jiu jitsu class for those who are 50 and over. At 62 years old, he has 43 years of martial arts experience. One would be wise to take notes: 9th degree Black Belt in Soryu Karate, Brown Belt in BJJ, 2-time World Champion at the IBJJF World Masters in 2014 and 2016. He was inducted into both the national and international Martial Arts Hall of Fame. Jeff's advice to those who would like to push away from the buffet and get back in the game is this: "You're never too old. I've seen 84-year-olds competing at the World Championships. Be patient, your martial arts journey is your own. Don't rush it. This is for life!" Then there is John Copado, co-instructor at Family Jiu Jitsu & Karate. He heads up the kids’ karate and jiu jitsu classes. When he speaks, kids listen. This in and of itself is a superpower in my book. John comes with over twenty years experience in martial arts. He is a 5th-degree Black Belt in Soryu Karate, Blue Belt in BJJ. In my opinion, no sport offers the versatility and potential for lifelong growth like martial arts. Martial arts is not a routine, a gimmick or a workout to be done for a short-term goal. It's a way of life that blossoms just like the seasons of your life. Four reasons why Jiu Jitsu is a great sport for the vintage athlete. 1. When you have friends to train with, people to push you and coaches who invest time in you, you’ll go beyond your self. 2. If you need to lose a few or struggle walking up stairs, martial arts will meet you where you are. Simply adjust your style to your current condition. Don't worry, you won't stay there long. 3. Jiu Jitsu is a thinking man’s game, think physical chess. Your mind, not age, is a discriminator. 4. Flush the gym membership. Nothing will get you in shape faster and better than grappling. Training in the anaerobic zone has countless data-proven advantages over the slow and steady aerobic zone. I'll get into that during the next few blogs. 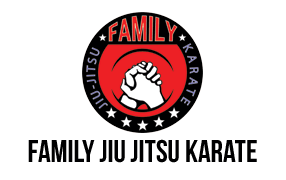 Here at Family Jiu Jitsu Karate, we offer more than another activity and more than a way to get in shape or check the boxes for better health. We offer you a new way of life and friends. You can’t play if you don’t get on the mat. Jigoro Kano, avid jiu-jitsu player, educator and the founder of Judo said it best, "It is not important to be better than someone else, but to be better than you were yesterday." About the author: Alan Harvey is a former Marine and now Army Nurse at Brooke Army Medical Center. He is an avid lover of Judo, Jiu-jitsu, and physical fitness. He writes Sci-fi books on Amazon under the pen name: James Garmisch.